4 Arrested In Murder Of Honduran Activist Berta Cáceres : The Two-Way Some of the suspects are said to have ties to DESA, the company building an electric dam protested by the environmental activist. Protesters demanding justice in the murder of environmental activist Berta Cáceres gather outside the prosecutor's office, in Tegucigalpa, Honduras, on April 5. On Monday authorities in Honduras arrested four people in connection with the murder of influential environmental activist Berta Cáceres two months ago. As part of an operation called "Jaguar," law enforcement arrested the four men, identified as Douglas Bustillo, Mariano Chavez, Sergio Ramon Orellana and Edilson Duarte Meza, based on "scientific evidence that support the allegations presented," according to a statement from Honduras' Public Ministry. The arrests were the first arrests made in the murder of Cáceres. In 2015, the activist won the Goldman Environmental Prize for leading a movement to prevent the construction of a dam that would have cut off the ethnic Lenca people from water, food and medicine. The project was being developed by Desarrollos Energeticos SA (DESA), The Associated Press reports. According to The Associated Press and the Independent, two — possibly three — of the suspects arrested Monday are said to have ties to DESA. La Prensa Honduras reports that the other two suspects have ties to Honduras' military. "So much so that the the InterAmerican Commission for Human Rights had called on the government of Honduras to provide her with protection. "La Prensa reports that police say Cáceres was killed at a house they were not surveilling." 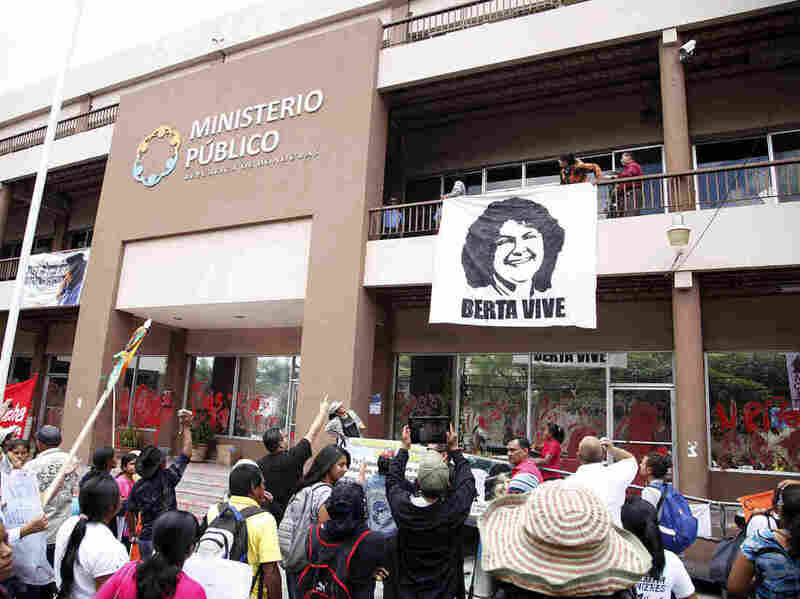 "We welcome the announcement of arrests in the murder of Berta Cáceres. "From the very beginning, we have called for a thorough investigation into Caceres' murder - one that followed the evidence and that would lead to those who committed the crime, including the intellectual authors. "We will continue to follow closely as the suspects arrested today enter the judicial process, as well as any future arrests, and will continue to support this investigation in any way we can."